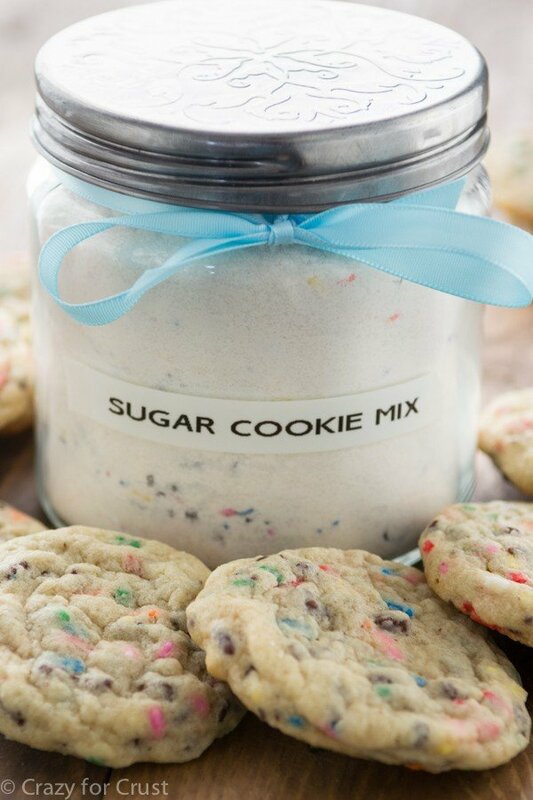 Homemade Sugar Cookie Mix is the perfect thing to keep in your cabinet for sugar cookie emergencies, or give it as a gift for the holidays! Why purchase the premade stuff? It’s finally cold here in Sacramento. The heat kept kind of hanging on (it was high 70s/low 80s last weekend) but finally, finally, the cooler weather is here to stay. It even rained last week! Ah, cooler weather. It’s time for socks, gloves, jackets, extra blankets, and eating more sugar to gain my winter coat. Er, or something like that. I think my body is craving another layer or something because I’ve been eating way too much. It started on my trip to Nashville and pretty much hasn’t stopped since. 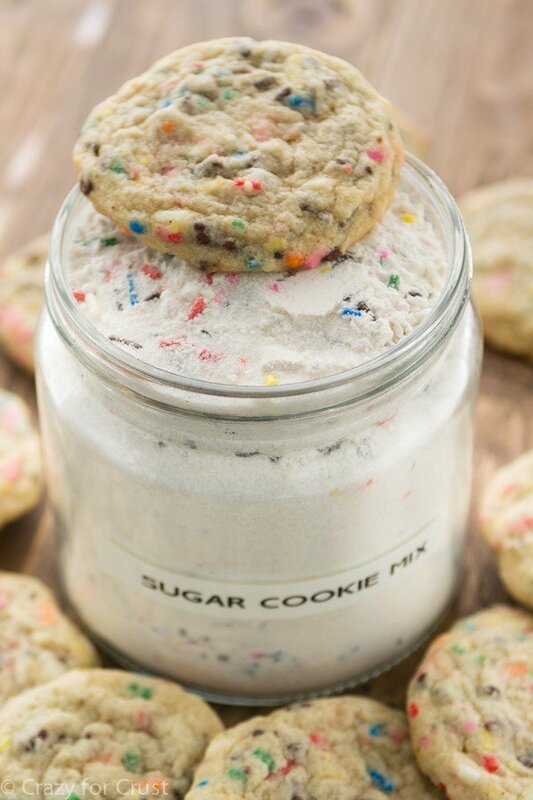 I was trying to be good…and then I made this sugar cookie mix. It makes the best sugar cookies in the whole entire world. I’ve kind of been in the “homemade mix” making mood lately. Brownie mix, then hot chocolate mix, now sugar cookie mix. Sure, I’ve been known to buy those pouches of sugar cookie mix at the grocery store. I’ve used them lots of times, even on this blog. But I like my sugar cookie recipe even more, so I figured I’d try to make a mix out of it. And it worked, fabulously. This is easier than making regular cookies. 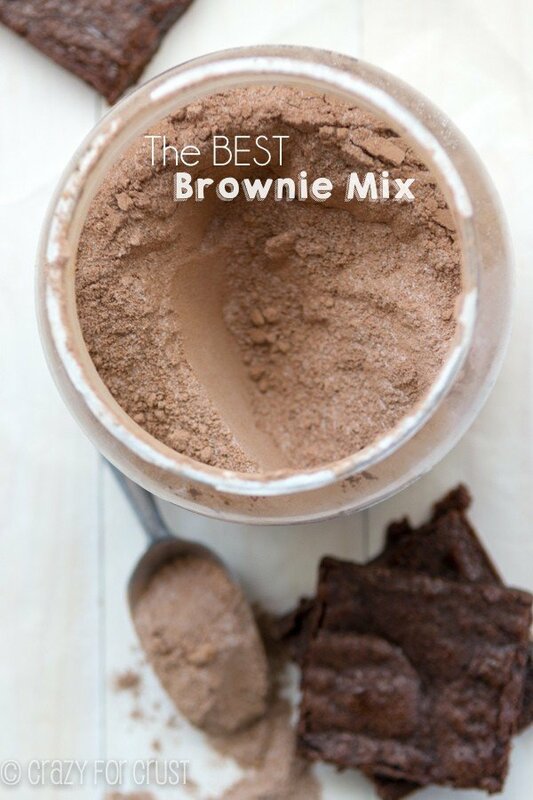 All you do is mix up all the dry ingredients and put them in a jar or a bag. When you’re ready to make the cookies, you beat in some room temperature butter, an egg, and some vanilla extract. Then bake as usual. 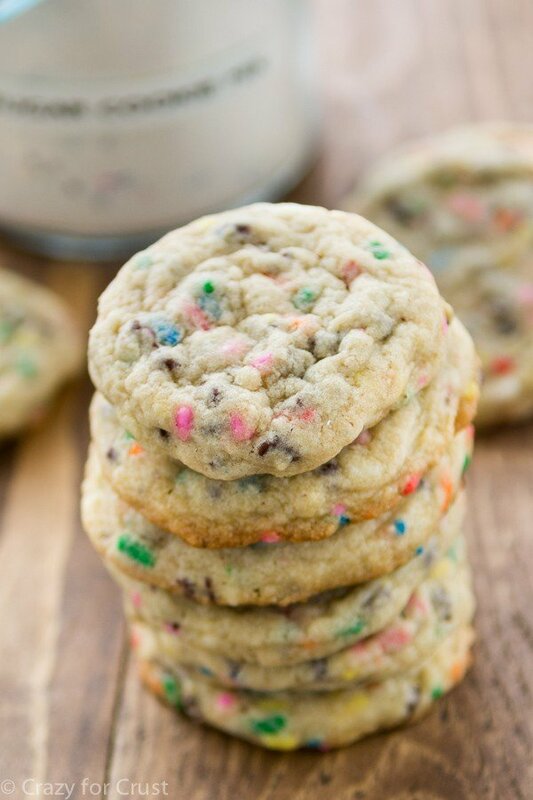 I added sprinkles and mini chocolate chips to my homemade sugar cookie mix. You can omit them, or you can add all sprinkles, all chocolate chips, or even add nuts. Just pop them in with the other dry ingredients. Something about mixing all the dry ingredients first and then adding the wet ingredients later made an amazing cookie. 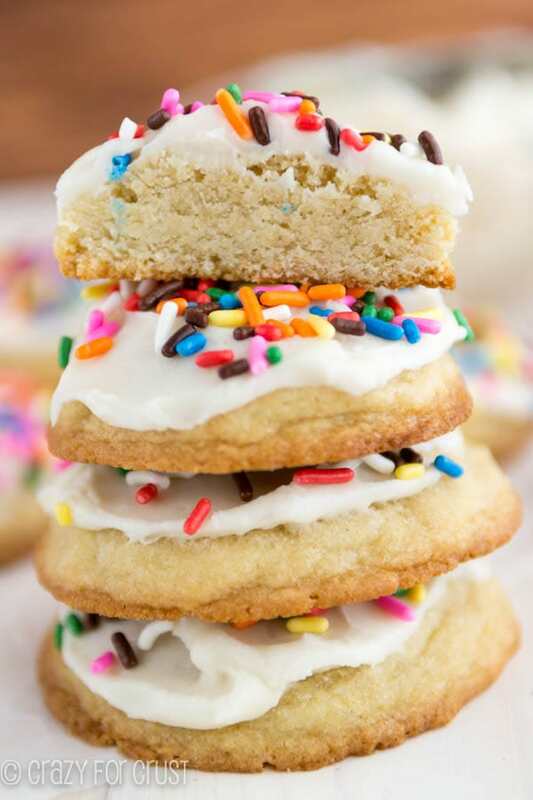 The sprinkles and chocolate chips gave these the exact amount of sweetness they needed and they ended up pillowy soft with the perfect amount of sugar cookie chew. I ate waaaaay too many of them. Half my new layer goes to these cookies. Make a few jars of this homemade sugar cookie mix to keep in your cabinet for whenever the sugar cookie mood hits, or give them as holiday food gifts. You don’t need to buy the cookie mix pouches anymore – trust me! Don't buy that sugar cookie mix at the store! 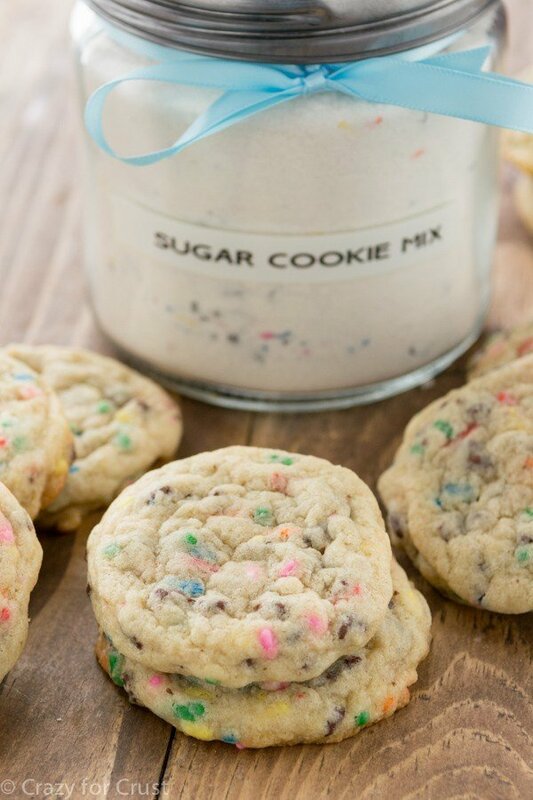 Make your own homemade DIY Sugar Cookie Mix! 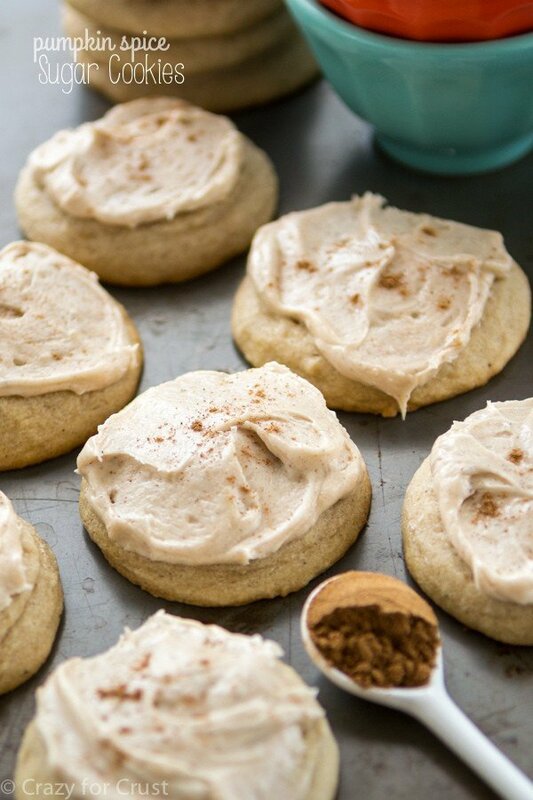 It makes better cookies and it makes a great holiday gift. Whisk all ingredients in a large bowl. Continue with making instructions or place in a resealable bag or large jar (3 pint to 1 quart sized jar or container). Place mix in the bowl of a stand mixer fitted with the paddle attachment. (Or, a large bowl if using a hand mixer.) Add butter and mix slowly until crumbly. (This will take a minute or two in a stand mixer; longer with a hand mixer.) Add vanilla and egg and mix until a cookie dough forms. Scoop 2 tablespoon balls of dough (use a cookie scoop if you have one) onto cookie sheets. Bake for 9-11 minutes. I like to take them out as soon as the bottom starts to turn brown (about 9 minutes for my oven) even though the centers may still be a little glossy, and let them finish cooking as they cool. Store in an airtight container or ziploc bag for up to 4 days, or freeze for up to one month. Just checking before I print out the recipe and make up a batch…you really meant one tablespoon of vanilla, not teaspoon? Can’t wait to try them! Hi! 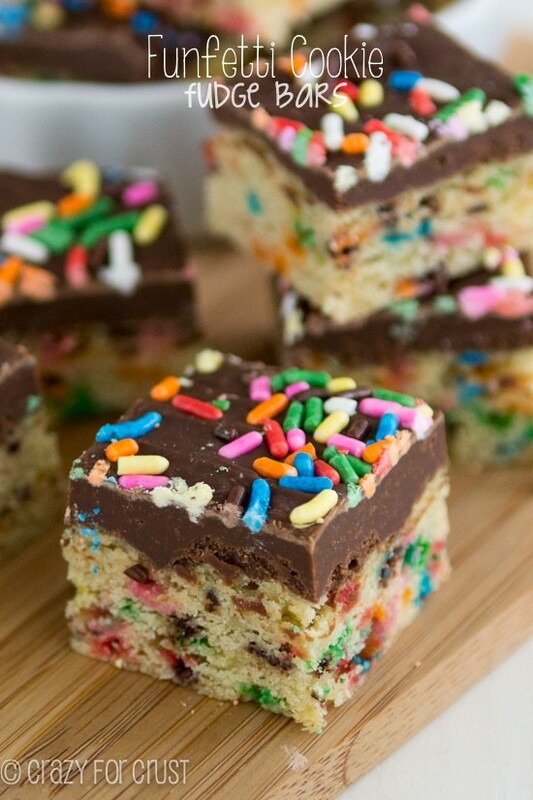 I’d love to make this but I’m wondering that how long can I store it before it goes bad if I use chocolate chips? I don’t think anything in the mix is very perishable, but if there is an expiration date on any of the ingredients in the mix go by the shortest of those dates! Ok, thanks! Can’t wait to try! I love the look of these and think they would be a great way to gift some cookies to my son, he’s just newly moved out. Your recipe says to add 3/4 cup of mix ins, but you used both sprinkles and mini chocolate chips and found it to be the perfect combination. I was wondering how much of each did you use. Equally amount of each to make 3/4 cup or maybe 1/2 cup of one and 1/4 cup of the other? I think it was about equal of each. I just filled up my 3/4 measuring cup with them both! Hello, I love your site!! I have a question ???? I have many great sounding bar recipes BUT they all call for a pouch of B/C sugar cookie mix I do not want to use a mix ; it kind of defeats the home made purpose of homemade! could I use your sugar cookie mix recipe instead of Betty’s ?????? I haven’t, but I’m sure you can try! Let me know if you do, how it works out!